Community-supported fisheries deliver the freshest catch to consumers. They could also be a boon for a troubled industry. ROCKLAND, Maine - On the first Saturday afternoon in March, warmer than any other afternoon in recent memory, Elizabeth Cuccinello pulls up to the Good Tern co-op. In the bed of her truck is a big turquoise cooler. tongue, these shrimp are particularly sweet and tender. People receive the bags into their arms, a gift from the sea. "I'm like the shrimp fairy," Cuccinello says. This is one of seven drop-off points for Port Clyde Fresh Catch, which is a community-supported fishery: Participants sign up, pay a lump sum for the season, then receive a weekly share of seafood caught by the members of the Midcoast Fishermen's Cooperative. Pioneered here last year, the idea is spreading through Maine and beyond, with a CSF in the works for the Gloucester area that could ultimately serve Boston as well. In the winter, Port Clyde Fresh Catch offers shrimp - wild and pulled from Maine waters rather than farm-raised and potentially treated with chemicals, from somewhere as far away as Thailand or Brazil. In the summer, it offers fish. On any given week this could be pollock, cod, hake, redfish - whatever the fishermen bring in. The fish are delivered gutted but whole, the shrimp still in their shells. The tradeoff for freshness is a bit more labor and a lack of choice (the CSF offers filleting instruction and recipes), but also shells and bones with which to make stock or fertilize the garden. If this new model sounds familiar, that's because CSFs work in much the same way for fishermen as CSAs (community-supported agriculture) do for farmers, with many of the same benefits. Consumers get the freshest local food, and the money goes straight to producers, with no middleman. In addition to shrimp and fish, community-supported fisheries for lobster and mussels have now started up. For seafood lovers, CSFs are a boon. For fishermen in a troubled industry, they could be a lifeline. But for fishermen, it's considerably more than what they get selling to wholesalers, who buy shrimp at just 30 to 40 cents a pound. When the wholesalers aren't buying, the fishermen are out of luck. "The mood here is pretty discouraged," says Cuccinello. "Lobstering didn't pay off last year. Shrimp they've been putting quotas on. This is where our future lies." Though only a small portion of their catch went to the CSF last summer, fishermen really felt the difference, says Glen Libby of the Midcoast Fishermen's Cooperative. "The percentage of income was way up, in some cases 300 percent for low-value species like pollock, say. We got a lot more for them, and people really loved the pollock. A lot of them said it was their favorite fish." The CSF isn't just a win-win for fishermen and consumers. It's good for the environment. When fishermen get higher prices for their catch, they can afford to fish less aggressively. The cooperative requires members to use more sustainable fishing methods, and in advising fledgling CSFs, it encourages them to do the same. "This thing was started as an incentive for fishermen to adopt more conservation-oriented fishing practices," Libby says. "It's tough to go out there and catch less without compensation. This gives average consumers a way to help. They're supporting fishermen doing things a different way. It means something. It's not just lip service." The CSF model is a natural for the Gloucester area, a fishing center where markets are nonetheless often stocked with seafood from faraway lands. "We don't have access to fresh, quality seafood," says Angela Sanfilippo, president of the Gloucester Fishermen's Wives Association, a nonprofit that promotes New England's fishing industry. "Forever the complaint is 'I cannot get a piece of fish off the boat anymore.' Most of the fish doesn't stay locally. What we end up buying probably comes from somewhere else. That's not right. The public should have access to their communities." 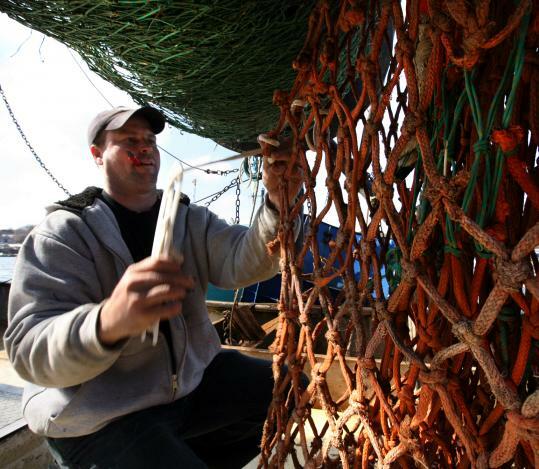 Cape Ann fishermen face many of the same issues as their counterparts in Maine. "All the shrimp in markets now, it's imported from dirty farms," Sanfilippo says. "And it's expensive. Here, what are they getting, 40 cents a pound for their stuff? Boats cannot go out. To lose this fishery because you cannot sell enough to make it profitable, it's the craziest thing." The Northwest Atlantic Marine Alliance, which works with fishing communities on issues of ocean health, has been a key force in promoting community-supported fisheries. Collaborating with the Gloucester Fishermen's Wives Association and other locals, it's close to getting a Cape Ann CSF off the ground. "We've got the bags and the twist-ties and the scale just waiting," coordinating director Niaz Dorry says. "The goal is to do a shrimp CSF this winter, but it has to happen within the next month. The season closes in May. We're committed to a groundfish CSF in the summer and shrimp next winter at minimum." They expect to find out whether they've secured key funding any day now; more than 100 people signed up to participate at the Cape Ann Farmers' Market last year. Several groups serving the Boston area have already contacted them about forming partnerships. "We feel reaching the population that cares about where their food comes from, and getting them to care about where seafood comes from, allows us to expand the base of support for policy changes," Dorry says. "Fish gets left out of the issue when we talk about food safety and food sovereignty" - that is, producers and consumers determining food systems, rather than markets and corporations. "To change that, we felt the best way is by reaching people through their stomachs and their hearts." That's clearly happening in Maine. "We like the fact that these guys are right down the road from us," says Port Clyde Fresh Catch member Kirk Folk of Rockland. "We get 10 pounds of shrimp a week, which is great, but it also keeps them in business. They're a cool bunch of guys; we've met a few of them along the way." He and his wife, Susan, hope the experience will rub off on sons Zachary, 12, and Luke, almost 8. "Maybe this will inspire them to be local and stay within the community," he says. "I hope they learn that where their food is coming from is important and get a better understanding of what it takes to make that food a sustainable resource. We hope to instill conscientiousness about it." Steve Cartwright, a freelance journalist who lives in Waldoboro, also participates in the CSF. "I love fish, I love fresh, and I love local," he says. That's the stomach part. Now for the heart. "The fisheries are in big trouble. This is one hopeful sign of what could be a comeback in a sustainable way," he says. "And the interactions alone are worth it. It makes you feel like part of a community." For more information, go to www.portclydefreshcatch.com or www.namanet.org.